Vinyl Guest/Seminar Chair - Free Shipping! 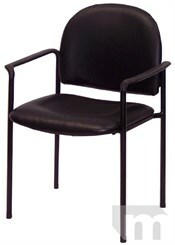 The SteelWorks Stackable Guest/Seminar Chair is an excellent combination of style and value. Ideal for reception areas, seminar rooms, training rooms or break rooms. Strong tubular steel frame and seat supports with soft 1-1/2" thick waterfall seat (18-1/2"W x 19"D) and back (19"W x 15"H) are slightly contoured for comfort. Upholstered in Soil and Stain Repellent easy-care Black vinyl. Stackable for storage. Measures 23"W x 22"D x 33-1/2"H overall. Matching tables available with 1-1/4" thick tough high pressure laminated surfaces. Easy assembly. Shipping weight 20 lbs. All components exceed ANSI/BIFMA commercial use requirements. Meets CA fire foam approval. 5-Year Limited Warranty. PRICE INCLUDES SHIPPING! IN STOCK!